Ok, not really…but I did get to appear as an background extra on the Sopranos last Thursday night (3/15/07). I came to a small church basement which served as the “Holding Area” for the extras. As I walked in I was greeted to a barrage of 150 Asian extras, all waiting to go on camera. We were instructed to bring winter clothing. I grabbed my I-9 form and went to a table to fill it out. I wondered to myself if my friend John, who’s costarring with me in Belly Full Of Anger would show up. Well, lo and behold, he sat down right at my table. So we chatted for a bit and met some interesting people. It’s always fun to find out who amongst us were actual “actors” and who were just doing it for fun, or because someone prodded them to do it. The girl sitting next to me (Leena?) was a law student. I met an older guy named Clint who does extra work all the time. He was definitely a seasoned professional. He was very humble, not volunteering his resume like most actors do, but I did find out from him that he did a bunch of national commercials about a decade ago. I met a bunch of people who used to be actors but gave it up due to such little work. There is definitley something disturbing about that, and that moment just reminded me more of how important it is to do your own work and create your own opportunities. People swarmed the craft table. Let me make this clear. There are different types of craft tables. When you are SAG and a principal, you enjoy a fine assortment of fruits, vegetables, sandwiches, and candy. When you are a non SAG extra, you get some oranges, some bananas and a bunch of Entemmann’s packaged cakes and donuts. I went up to the table to get an orange and some cake. By the time I got there, all the plastic silverware was gone. People had to break off cake with their hands (gross!) I took a much more Macgyver approach and used the edge of my paper plate to cut a slice. I was really disturbed by this, seeing these people scraping for food, and felt like I was part of Steerage on the Titanic. 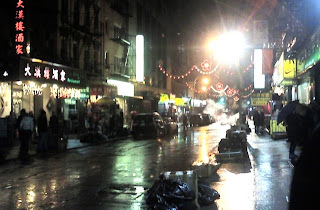 We all went outside and walked a few blocks to the shooting location in Chinatown. It was pouring and very cold. A PA (Production Assistant) walked by and asked each of us if we brought an umbrella. I was one out of a few, and they pulled me out of the crowd and we were put into a “splinter” group. Basically a second location shooting unit. They had fake snow on the set, which was very cool. It was quite a simple trick. They had a PA light some kind of candle. Then he stuck it in a small bucket tied to a string. The PA swung the bucket around and white ashes came flying out and filled up the entire street with fake snow. It looked really great. And then it got in my hair, mouth, and eyes, and then it was not so great. I got to play a couple along with this girl who had just gotten married and is a fashion designer. Our big task was to walk across a Seafood store front. The first few shots they yelled cut before we made it on camera. Damn. We didn’t give up hope. The next few shots we did make it across and we high fived each other after the director yelled cut. Sad that we felt such a feeling of accomplishment for such a small task. We did this for two more hours. We were sent back into the holding area for a quick 10 minute break. We went back to the first unit location and shot some sidewalk scenes. This time we actually got to see a Sopranos star. At first we all thought it was Tony Soprano himself, but he looked really small. I got a closer look at him later and I think it was Paulie Walnuts played by Tony Sirico. They shot his scenes with a Steadicam. They had to film him walking through the intersection of a busy street, so they would just wait until the lights turned red, the entire crew would run out into the middle of the street, they would call action, usually while the lights turned green, and they would film while a street cop would hold traffic back. Long live Guerilla filmmaking! Back to the Steerage to dry off. Last Shot. Truly beautiful words. That means we would be out there for only a couple of more hours. This was a large crowded street scene. A car driving down the street, with people crossing left and right. One of the ADs asked me and John if we could ride a bike. We said yes, and were given two bikes to ride down the street on camera. Cool! Not. It was very very scary. The streets were wet, the pedals were wet, and the extras were all over the place, I nearly crashed just trying to avoid them. After a few hours of that, they yelled “Check the gate” which is a really good sign of that being the final shot. We were wrapped and all headed back to the holding area to hand in our I-9’s. John and I decided to ask the AD if they would give us a SAG waiver since we had to ride bicycles in the shot, which technically is a special skill. Unfortunately he said they didn’t have any left to give out as they met their quota for the day. Sure, give it to the guy whacking mackeral against an ice block, but not to two skilled riders of two wheeled transportation. Bummer. I think you need 3 waivers to join SAG, which would have been great. But, oh well. Overall it was fun to be on camera and to watch the crew work, as well as meet some new people, but the weather conditions outside were pretty bad. I think I got sick from being out there for 6 hours. I didn’t get whacked, but that to me was close enough.